CAB formed as a community initiative in 2015 as a result of the community coming together to see how they could better support economic growth in our communities. The appointed steering committee has been supported by the CSSC community development worker to strategically plan their direction and achieve their goals. The group was also supported to apply to make an application to the TCDC Coromandel Colville Community Board Local Economic Development Grant to support their projects. Sustainable and enriching economic growth for the northern Coromandel Peninsula. Community connections: Building inclusive connections and relationships within our local community and with our wider communities. Partnerships with stakeholders: Building partnerships that are beneficial to our local community. Holistic sustainability: Actions that contribute to the economic, environmental and social sustainability of our community. Community driven innovation: Innovative developments from our community for our community. Our community is the people of Te Moehau in the north, south to Papa Aroha on the west and Tuateawa on the east. - updated the promotional material for 2018. 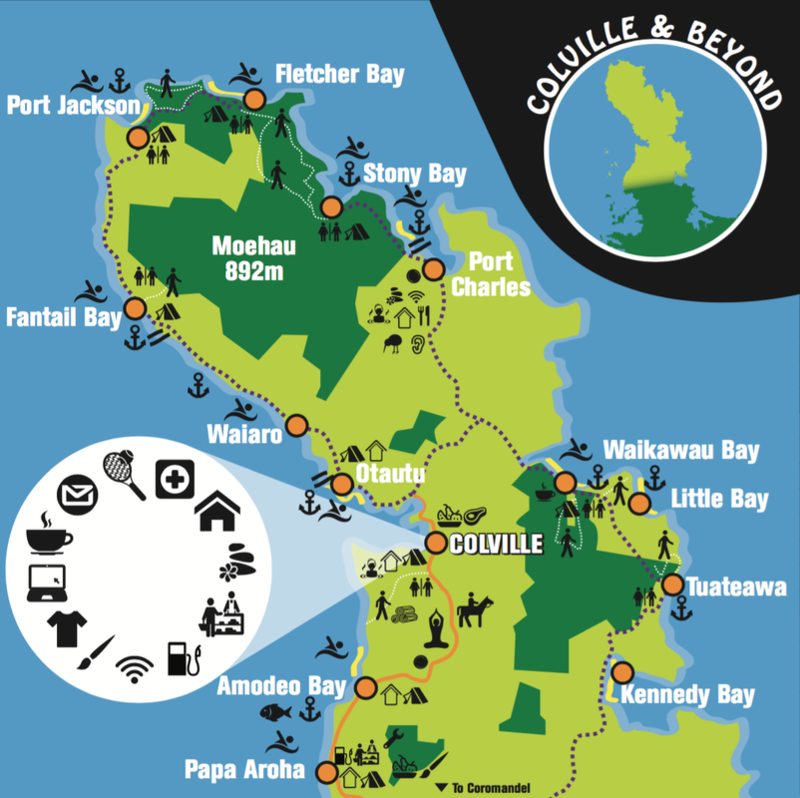 The Colville And Beyond Trails group is a sub-group of CAB who focus on trails in the northern Coromandel peninsula. Mission: To create and promote an ecosystem of trails* that enable enjoyment of our spectacular environment. *any journey – land, air and sea. ​The Colville And Beyond Trails Group have put together a 'Trails Pack' to showcase the ecosystem of walks in the northern Coromandel Peninsula.The packs have been hand illustrated by local artist Rebekah Pearsons. Each card has local information about the walk and what makes it unique. Thank you to our skilled community members who have given their time to make the CAB Local Directory and graphically designed the promotional material. ​Thank you to TCDC Coromandel- Colville Local Economic Development Grant. ​Community Waikato has given excellent support the Colville and Beyond group and Trails group .